Welcome back! Spring is finally here, and we are excited for all the new changes a new season brings. Scroll below to find out what your kiddos have been up to this month! Playing the insrtuments and songs we learn about in capoeira class with Teacher Jaga. Over the past several weeks, Sequoia class has been deepening their knowledge of water. The rain has prompted many questions like : What is rain? Where does it come from? What are clouds? After experimenting with making our own clouds in jars, we painted pictures of the water cycle, learning about evaporation, condensation, and precipitation. We built dams with sticks and sand in the forest and at the playground, understanding how water can be diverted and collected, and harnessing more skills in building collaboratively with each other (a never-ending lesson). 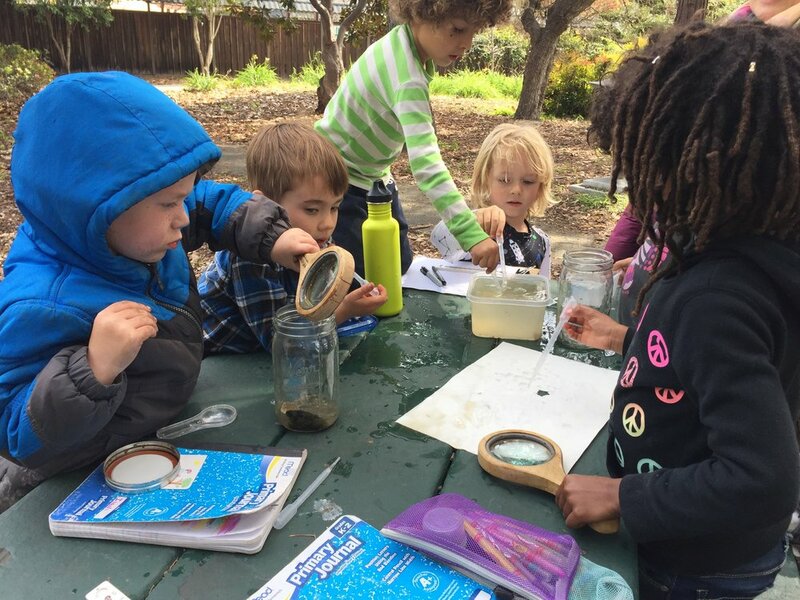 We observed with magnifying glasses and small microscopes the differences and similarities between pond water, faucet water, Lake Merritt water, and rain water. There are lots of living things in Lake Merritt water and our pond water, it turns out! Including small shrimp like plankton. We collected and measured rain water in containers throughout the garden (it rained 2 inches over a stretch of 2 days in March!). And in close step with learning the "Everybody wants to be in Oakland, This is Ohlone Land" song in music class, we learned about the history of Lake Merritt, and how the colonization of present day Oakland led to the conversion of what was once a lagoon where Ohlone people fished and drank water, into present day Lake Merritt. Some made connections between the colonization of Ohlone land and the impacts on Ohlone people to the evictions of people in present day Oakland. We concluded our unit on water making water filters. As we filtered mud, dirt, and sticks from water, we considered where our own drinking water comes from (a river called the Mokelumne River, 85 miles northeast of here) carrying sticks and rocks and dirt that need to be filtered out before we can drink it. Turns out we could spend a whole year just learning about water! Well Spring is finally here and the Birch class has been excitedly learning our own lessons about water: what objects sink and float, what happens when different things are added to the water (food coloring, mud/dirt), and what animals live in the water we share. Our forest days have been spent doing lots of hiking and exploring in the hills of Joaquin Miller Park. 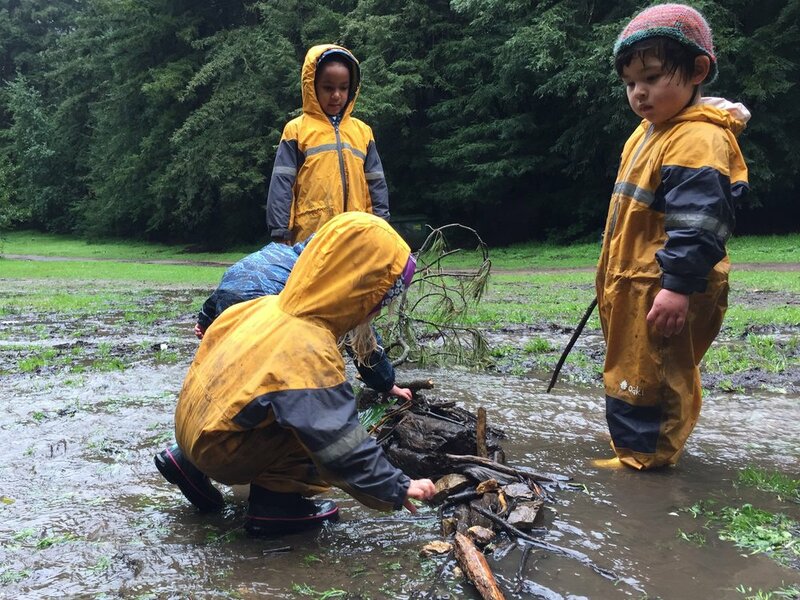 With our rainsuits protecting us we ran, splashed and stomped through puddles and rivers of water while learning about and identifying banana slugs, salamanders, and even tiny waterfalls. 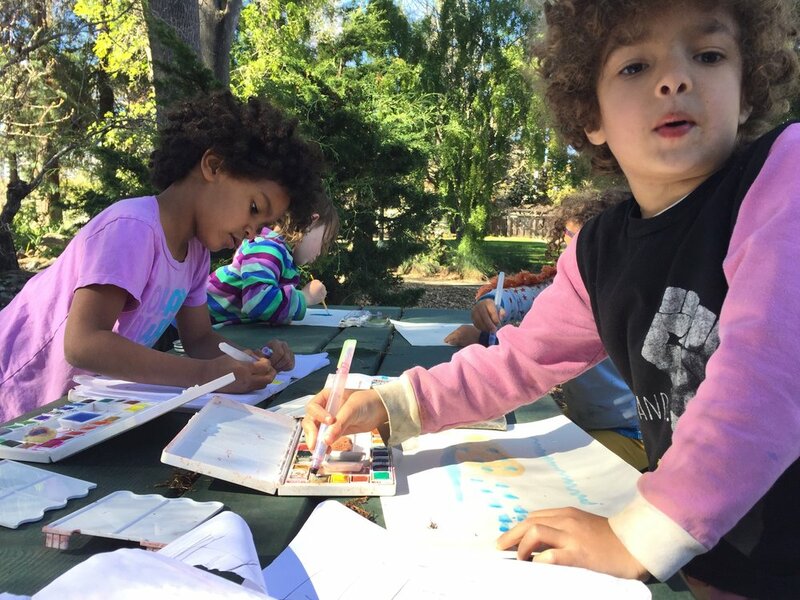 In April, we are looking forward to the warmth of more sunny days, more water play, and planting and cultivating the seeds in our garden plot. Summer registration is filling up FAST! If your contract includes summer, please sign up here for the dates you will be joining us using the FORESTFREEDOM code. We have closed registration to give our long-time families to register, but will be reopening it to new families on April 30th, space permitting. We're so excited to see everyone at our Forest Freedom Community Day this month! Please see the invite below - we hope everyone can make it. Please be sure to check backpacks daily. If your kiddo is in diapers please make sure to send some more if you haven't recently! Our LOST & FOUND is filling up and we need your help to get missing items back to their owners. We ask that you please label ALL items your child brings to school (jackets, hats, stuffed animals, lunch bags, water bottles, extra clothes, etc).